[ACT](VC) Limit Break 4 (This ability is active if you have four or more damage):[Counter Blast (2)] Look at the top card of your deck, search for up to one «Gold Paladin» from among them, call it to an open (RC), put the rest on the bottom of your deck, and increase this unit’s [Power] by the original [Power] of the unit called with this effect until end of turn. 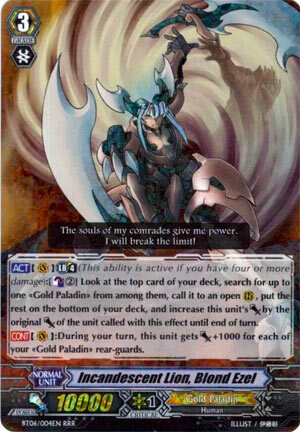 [CONT](VC):During your turn, this unit gets [Power]+1000 for each of your «Gold Paladin» rear-guards. Honestly, until Platina Ezel came out this was sort of meh. You only ran him because Kyrph was the only starter. Once we got Spring Breeze, he should have been dropped for Garmore (for those not on the Spectral Duke train, and not many WEREN’T) simply because Garmore hit the same numbers and could CHOOSE what he called. Previous articleMore Lost Artwork for the Yu-Gi-Oh! TCG Has Been Discovered in the U.S.